NILFISK are a company who are dedicated to making the world that we live in a cleaner place, with a history of manufacturing and supplying cleaning products that stretches back over 110 years. From humble beginnings in 1906 in a small Copenhagen workshop, the first truly portable single operator vacuum cleaner was invented, and over the following decades, the company grew into one of the world’s leading suppliers of professional cleaning equipment. That early innovation in cleaning technology from company founder PA Fisker is still evident in the range of cleaning products supplied by NILFISK today, with consumers benefitting from vacuum cleaners for wet and dry environments, but also from steam cleaners and pressure washers. NILFISK vacuum cleaners have a reputation for lasting not for several years, but for several generations, with these highly effective cleaning machines bringing the owner unrivalled levels of filtration and suction, to enable you to keep your home or workplace spotless. Nilfisk also provide a full range of accessories, including consumables such as dust bags and filters. 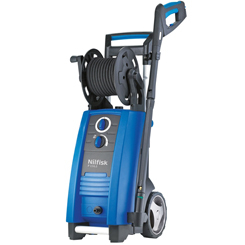 The mobile and versatile pressure washer range from NILFISK contains options for domestic and professional use and is ideal for keeping the car, caravan or your patio and decking clean. The design of the washers makes using them a pleasure, with telescopic handles and click and clean accessories allowing for easy storage. This click and clean system means that you can easily change the nozzles and brushes on your power washer to enable it to perform different tasks.